Well it is about time I got this post up because it has been a month coming. Following the D.T.W.C. meet recently, there was enough left for 1 dram of The Yamazaki Single Malt Whisky 12yo to do a secondary tasting in isolation. Before we begin here is some minor background details. 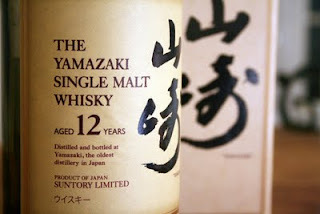 The Yamazaki Single Malt is produced by Suntory Limited of Japan. Japanese Whisky's have been around a long time. As far back as the mid 1800's the introduction of American whisky had arrived as Japan opened its doors to foreign trade. As a general rule Japanese whisky is crafted after the style of Scotch whisky which had settled as the standard style of production in the early 1900's. In brief Japanese whisky most certainly tastes and looks like Scotch whisky (with a Japanese twist) and most certainly has no baring resemblance to bourbon. So here it is, The Yamazaki Single Malt Whiskey 12yo by Suntory in a screw top cap. On the nose: one gets floral notes. Soft and clean. Overall not too complex but not ordinary either. The best I could relate it to would be musk without the sugar sweetness. Having travelled to Japan many a time and staying for some prolonged lengths, I do not find this musk sense unusual. Japanese are very good and very proud of taking something, perfecting it, and then adding something else to make it their own. To taste: sweet(ish) like rose water, then sherry plus oak. At first there is a softness on the tongue. Then it becomes dry very quickly with that hot alcohol effect in the back of the throat, but it does not loose the flavour. The finish is a bit 'odd.' It almost gets there but then falls short leaving a slight metallic finish and then weakens quite quickly. This is most certainly the most disappointing part of the whole experience. Overall I would give it a 5 out 7. It is one of those experiences you should take the time to taste. As a recommendation this is worth a note. In the past I had written about the unexpected flavours of the Suntory Hibiki 17yo blend. This I feel is much better than the Yamazaki 12yo as it offers more complexity and balance. TRY IT as you won't be disappointed.